*Items in this article were sent to me for the sake of review. Having an office job means that for the most part, we get to dress however we want to. Obviously, we have to dress smart and professionally, but we have the freedom to show up to the office wearing pretty much anything we want to. BUT, this has its downsides despite the obvious upside of having the freedom to express yourself: What do I wear? It’s always stressful in the morning choosing what to put on, you want to look your best and you want to look smart – so what is the best thing in my wardrobe that is work appropriate, stylish and functional? I love my office job, honestly speaking, I like the fact that thanks to it, I can work Microsoft Excel and I know how to work my way around niche softwares, I also like how much I’ve learned in my office job and the fact that I know what days and hours I’m working, because they’re always the same, I know when lunch and break is and: I’m comfortable. There’s no weird uniform that doesn’t quite fit my curvy body because it’s a full on polyester top that hugs all of my rolls in the wrong areas and if I want to eat a pasta carton at lunch, the bloating isn’t going to be too noticeable. But obviously I understand that getting dressed isn’t an easy task, so I decided alongside Simon Jersey* to put together an outfit that will look good on all body types, all shapes and sizes and is office appropriate. By this, I mean lay off the patterns and have a neutral palette. In my outfit I decided that I was going to be as plain as possible, and that my coat and beret, which I’d be wearing outside of the office, would be where my ~jazz~ was. This is a bit of a bias, but as a kid in school I always thought my teachers looked so professional in booties. I like my square toe boots the best, they have a small heel on them, enough for me to be able to walk in them without walking on my tip-toes. I also like them above ankle length to make me look a liiiittle bit taller. I like to wear a watch to work because sometimes the computers are a few minutes ahead, and in this outfit I chose to wear a small pendant around my neck, it actually matches the colour of my blouse which is a huge bonus for consistency, especially when your outwear is taken off. 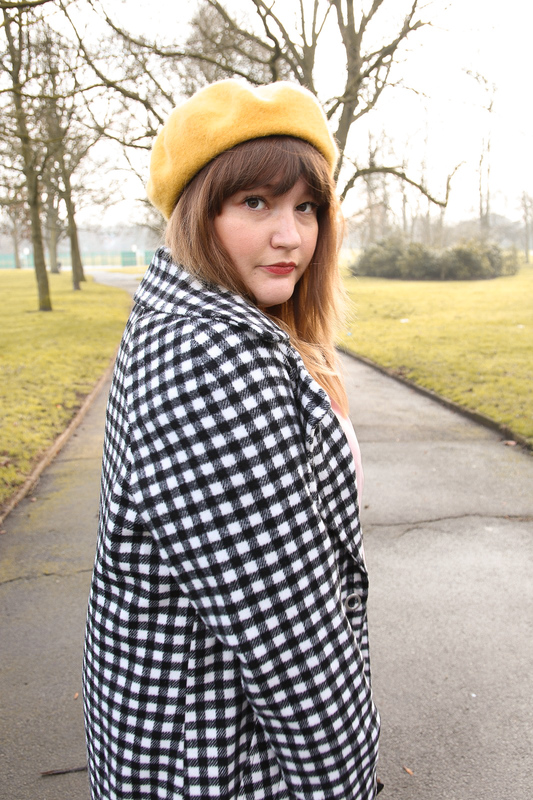 I also chose a yellow beret as my pop of colour, and I also think pink and yellow look lovely together. When I was putting this outfit together, I wanted to keep it so that it was still my style whilst being designed to wear to work, I spent some time thinking about what I like, what colours I like and what I like to put on my feet, and I think I came up with the perfect look. This blouse is perfect for the office, it’s perfect for all shapes and sizes and looks stylish when dressed up and dressed down. It has little ribbons on the arms which look adorable, and its deep v neck cut means that you can wear a bit of jewellery to really glam your office look up! I actually wanted to tuck in the blouse because I like the formal, yet relaxed look that this gives, so for the first time in about a year I reached out for my jeans in my wardrobe and tucked my blouse into them. I like the affect this gives your outfit, it definitely makes it a lot more formal even though you’re literally just wearing jeans and a blouse. Outwear is just as important, and right now I’m obsessed with long coats, and this gingham one popped into my mind immediately. It’s monochrome so it fits in with my outfit without clashing with the colour scheme, and it’s slightly oversized which means it’s comfortable to wear even on colder days. Next Post WINTER FASHION AND I: DO WE GET ALONG?